I have an extra Brawlers disc 1 and need to trade for Bawlers disc 1. I had two duplicate sets in my boxset. I exchanged one of the duplicates for an LP missing in my collection and now need to find a mate to trade with to fix my problem with my last duplicate set. I need a Bawlers disc 1 regardless of whether I trade for it or not, so if you've got one you want to sell but don't want to trade, get in touch. I'll pay a fair price for it. Name your price, and I'll consider it. UPDATE January 2018: I am looking for Bawlers Disc 1. I will pay good money for it or I can trade a Brawlers Disc 1 for it. I have two Bawlers disc 2 but no Brawlers disc 2. Would love to buy a Brawlers disc 2 from somebody or trade if anyone is in need of Bawlers disc 2 in exchange for a Brawlers disc 2. Mine are tip top mint. I’d like to trade for a disc in comparable shape. Anyone have any idea of how many copies this was limited to? Can somebody point me in the right direction for help? I bought the 7-LP pressing of this when it was new. I have a tendency to buy records, and they sometimes will sit on my shelf for years before I open them and play them. I played my copy of this for the first time last year, and it sounds beautiful. The problem is a packaging error, wherein there is no LP-6, and two records of LP-5. I've tried to contact the record label, to no avail. Is there anyone else I could reach out to to correct this error? I know the set is long-out-of-print. Maybe is there anyone out there who has two of LP-6, and would like to trade? 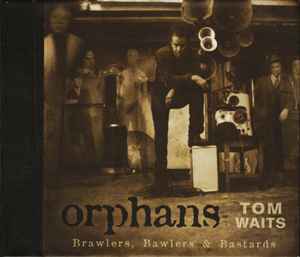 There were a limited pre order versions signed by Tom Waits himself. Anyone has this? There was a sticker on the front quoting music journalists stating how wonderful this was and that it was Mr Waits best effort yet, but personally I found it lacking and delivered with little conviction from what we have became accustomed to expect. Unlike his other albums the music didn't seem to hang together as a coherent unit and the title Orphans seemed quite fitting.